It's January 20th and that means it's Merritt Day here at the DMR blog. Merritt is (along with Clark Ashton Smith) the favorite author of this blog's Most Puissant and Fearsome Editor, Dave Ritzlin, and I rank Merritt pretty damned high myself. Thus, this day shall not go without remark and due respect will be rendered. "What's up with the title?" one might ask. Surely, A. Merritt can't be called the "Lord of Fantasy"? Ah, but he once was--by multitudes. In my opinion, he still sits with other great ones at the High Table in the Halls of Fantasy. Just as Genghis Khan was once named the Master of Thrones and Crowns and died as such with sceptre in hand, so was Merritt hailed as the Lord of Fantasy for decades, toppled only after he was in his grave for more than two decades. Also like the Great Khan, Merritt left many (literary) descendants to carry on his legacy and remember his name. Merritt's reach was vast. Robert E. Howard, Lovecraft, Clark Ashton Smith, Max Brand/Frederick Faust, Edmond Hamilton, August Derleth, CL Moore, Jack Williamson, Leah Bodine Drake, Lloyd Arthur Eshbach, RH Barlow, Hugo Gernsback, E.E. "Doc" Smith, A.E. van Vogt, Leigh Brackett, Robert Bloch, Poul Anderson, Ray Bradbury, Andre Norton, Donald A. Wollheim, Gardner F. Fox, Henry Kuttner, Sam Moskowitz, Julius Schwartz, A. Bertram Chandler, Lester Del Rey, James Gunn, Frederik Pohl, Algis Budrys -- all admired him. The same can be said for newer authors like Moorcock, Mike Resnick, Barry N. Malzberg, Lin Carter, Robert Silverberg, Ray Capella, Brian Stableford, Anne McCaffrey, Stephen King, Karl Edward Wagner, Fred Chappell, CJ Cherryh, Brian Lumley, Robert Weinberg, Gary Gygax, Ben P. Indick, Sheri S. Tepper, Keith Taylor, Robin McKinley, Marvin Kaye, Baird Searles, Ardath Mayhar, Gardner Dozois, Eileen Kernaghan, Piers Anthony, Stephen Hickman, Ed Gorman, Orson Scott Card, SM Stirling, Tim Powers, Raymond E. Feist, Elizabeth Hand, Frank Lauria, Cory Panshin, Douglas Preston, John C. Wright, Paul di Filippo, Charles R. Rutledge, John C. Hocking, Adrian Cole, Dave Hardy, John C. Tibbetts, Steve Rasnic Tem, Ryan Harvey, Christopher Chupik, Keith West, Fraser Sherman, JD Cowan, William Meikle, John E. Boyle, Brian Niemeier, Jim Fear, Jay Barnson and Aonghus Fallon. Now, imagine if none of those authors had ever written fantasy or sci-fi. At the least, imagine if some of the wild imagination and wonder was taken from their works. Weird/speculative fiction would be completely different without Merritt. Also, don’t forget that Lovecraft, Bloch and Wagner admired him for his horror writing. As I said, Merritt's title of "Lord of Fantasy" went unquestioned here in the States from the 1920s until the 1960s. I've spoken with numerous pulp scholars and all agree that Merritt's sobriquet went virtually unchallenged during that period. Donald Wollheim, the most important publisher/editor in the history of SFF, repeatedly called Merritt by that moniker for decades. Tolkien's reign is only now reaching the longevity that Merritt's enjoyed. So now, nearly a century after "The Moon Pool" hit the newsstands and launched him into the absolute top echelon of pulp writers, Merritt is just "a" Lord of Fantasy; one of several. Some would say a forgotten one at that. However, there are stirrings in the ether and outlands. Look above at the second list of Merritt admirers I posted. A fair number of those are newer authors just making their mark. They care not for the calumnies cast upon Merritt's name by wormtongues like James Blish and his ilk. 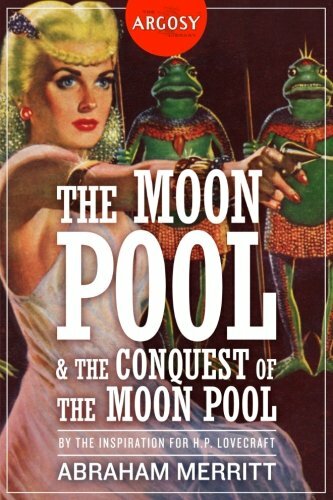 Altus Press has just published a quality reprint of "The Moon Pool" and "Conquest of the Moon Pool" in their original pulp versions--just in time for the centennial. The Old Guard remembers and the young warriors are hearing the great, classic tales for the first time. The shade of Merritt may yet stride forth from the shadows and be hailed as a "Lord of Fantasy" once again.